Home > Knives > Dexter > Kitchen / Butcher Misc. DEXTER KITCHEN / BUTCHER MISC. includes various Dexter Russell knives, butchering tools, honing rods, etc. Suited for both home users and professionals, all tools in this category are made in the United States with high quality materials and superior craftsmanship. Dexter's 8x2 in. Neoprene bowl scraper is for use in commercial kitchens needing a heavy duty bowl scraper for large batches of dough, foam, whips, etc. Scraper Dimensions: 8 x 2 in. Overall Dimensions: 8 x 3½ in. 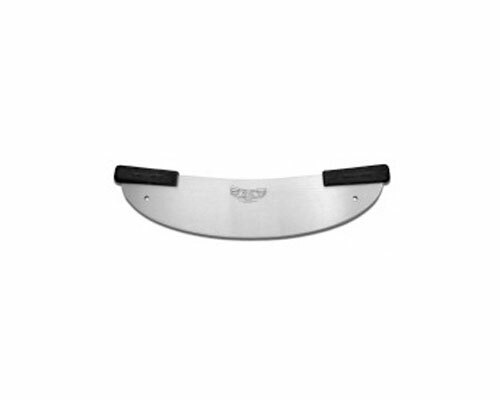 The Dexter Russell Sani-Safe 20" Pizza cutter is designed with the professional consumer in mind. NSF certified handles and a durable blade. 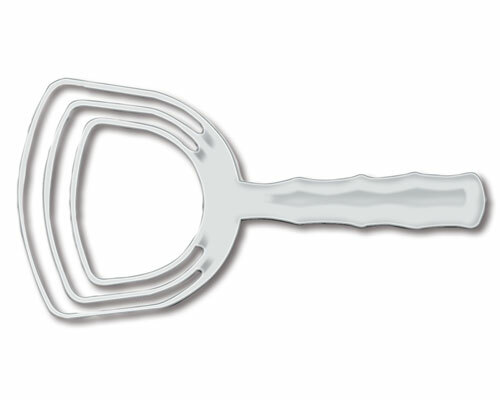 This cutter can be used to cut pizza, pastries and sheet cakes with ease. The SofGrip line is the ultimate choice in non-slip handles. Their soft rubber grip handles reduce stress that may cause fatigue and wrist injuries like carpal tunnel syndrome. 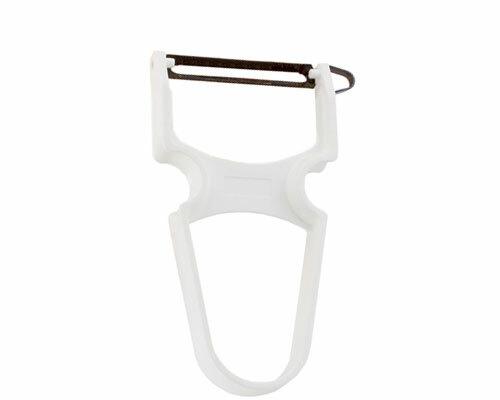 Available in black and white, the soft handle allows you to grip tighter to prevent slipping and increase control. Each blade comes with a proprietary DEXSTEEL, stain-free, high-carbon steel blade, with an individually ground and honed edge. Their superior blade shape allows for easier slicing while the unique edge geometry keeps them long lasting. 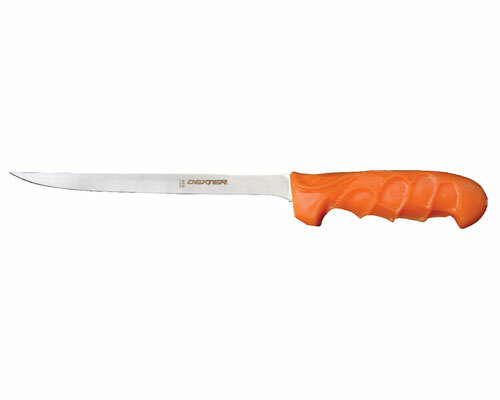 Not to mention, the seal between the blade and the handle will not let in any water or bacteria. 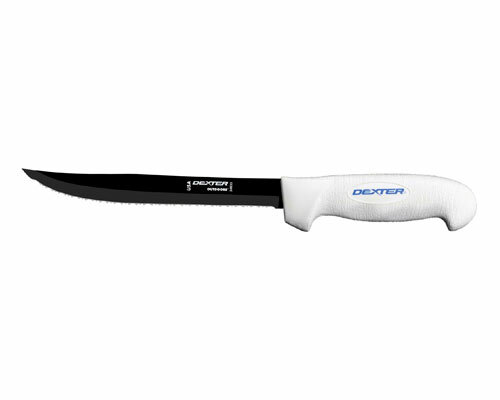 Dexter Outdoors series is equipped with the SoftGrip™ rubber handle. High carbon, stainless steel blade with a unique DexterGuard™ coating to protect blades from harsh environments, like salt water. The 8 in. 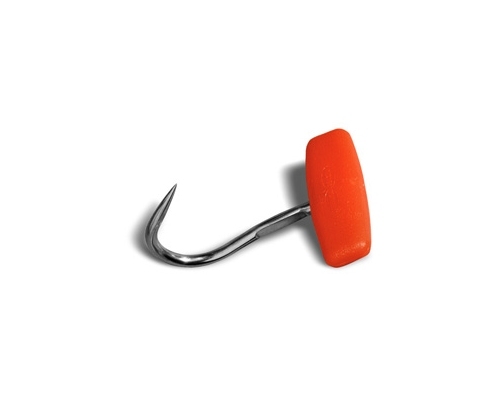 Sport Fishing/Breaking Knife is used for breaking down medium to large fish. The 10 in. 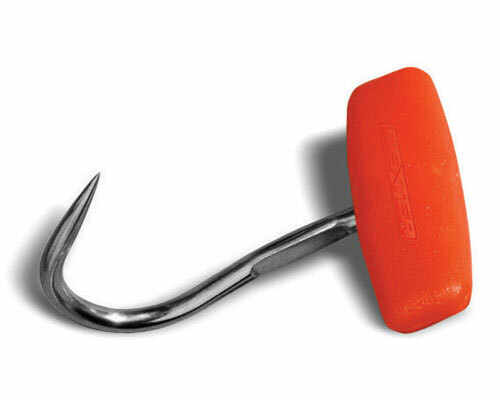 Sport Fishing/Breaking Knife is used for breaking down large fish. The 8 in. 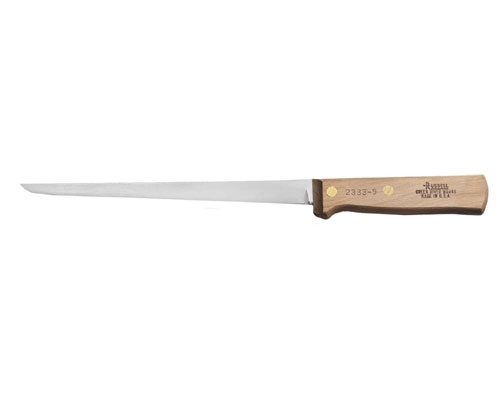 Tiger Edge Chum Knife is used for cutting tough rinds and glide through firm skins, just the same. 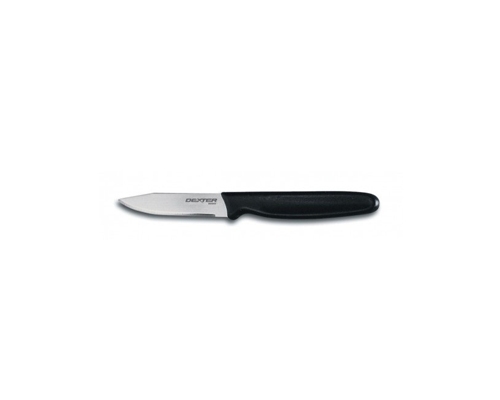 This knife has a multitude of serrations for specific purposes. The very edge of the blade is the serration to get through the tough/firm skins, while the inner serrations slice through soft innards with ease and gentleness as to not hurt the fruit or vegetable. 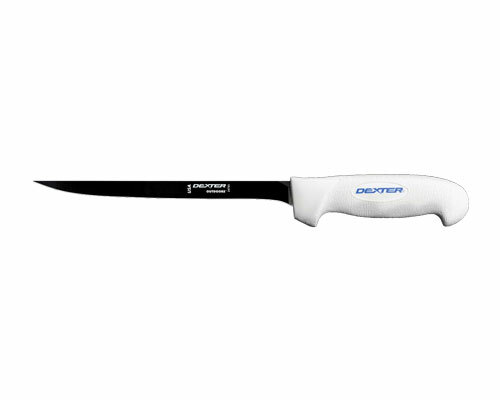 The Dexter Basics 2.75 in. 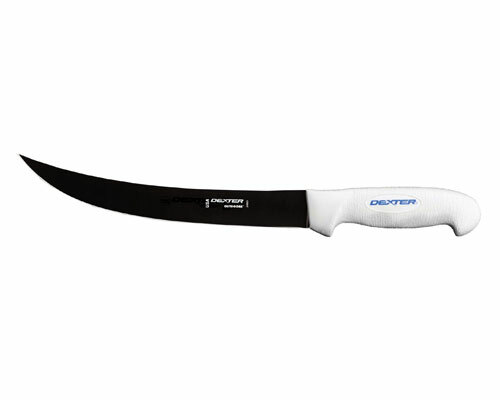 Clip-Point Paring Knife is a versatile straight edge knife ideal for small fruits and veggies and even trimming fat off of meat. 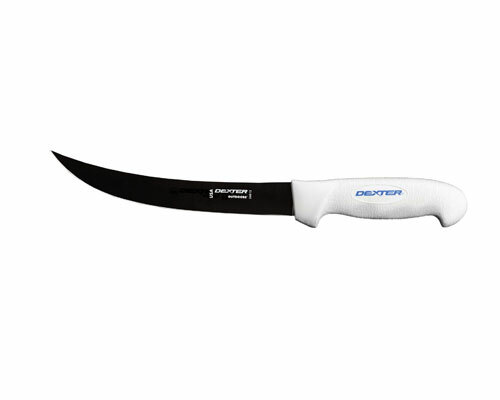 Stain-free High Carbon Steel blade with a hygienic non-slip plastic handle. 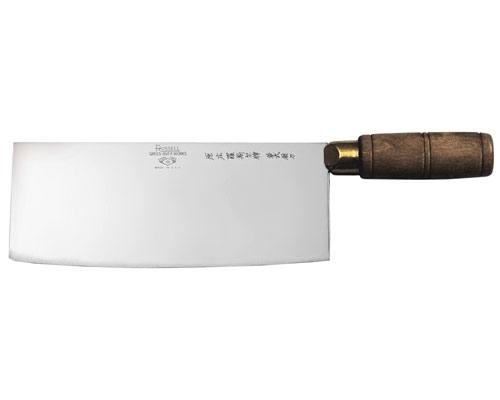 This is the knife you want if you are looking for value and performance in one. 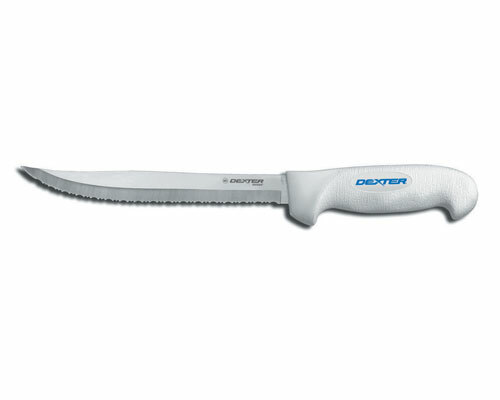 The Dexter 8 inch carbon steel fillet knife is easier to sharpen than a normal stainless steel knife. These knives can rust if not dried properly, and if that happens just rub it with a little Bar Keepers Friend (sold with Ajax and Comet at the grocery store). The quality of these cleavers can't be beat for that price, made in the USA. Dexter Russell began making Chinese Cleavers pursuant to the demand created by Chinese immigrants at the turn of the century. Dimensions: 7 in. x 2 in. 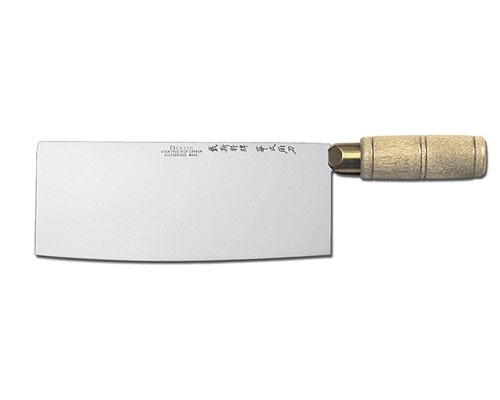 Recognized as the premier Chinese chef's knife, Dexter is well know for perfect balance, quality, and durability. 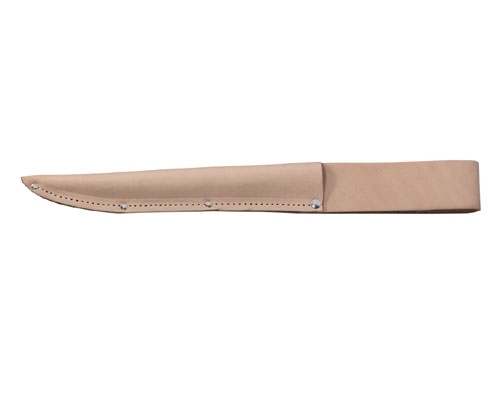 Great care has been taken by skilled craftsmen to create the extremely sharp edge on this knife. 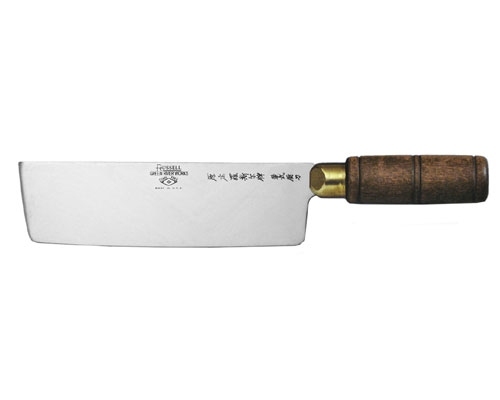 The blade is crafted from the finest stain-free, high-carbon steel and is securely fastened to the hardwood handle. 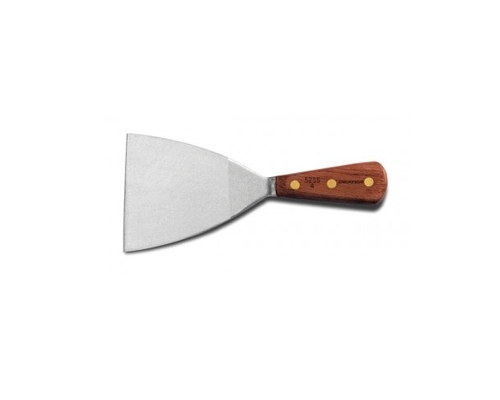 This precision tool is designed for slicing, dicing and mincing and should not be used as a meat cleaver. Dimensions: 8 in. x 3 1/4 in. The quality of these cleavers can't be beat for that price, made in the USA. 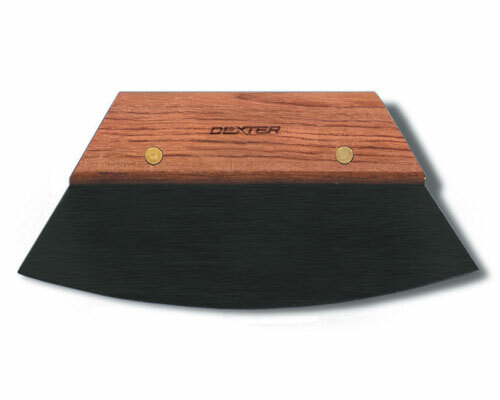 Dexter began making Chinese Cleavers pursuant to the demand created by Chinese immigrants at the turn of the century. 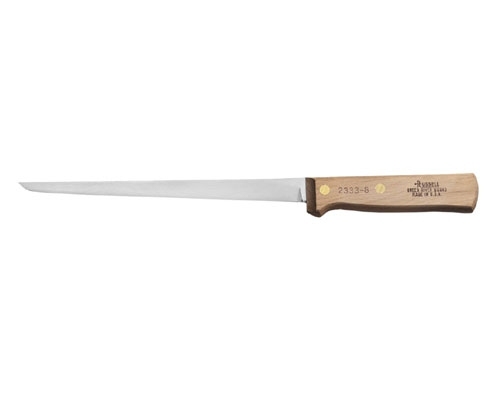 This knife is made from Carbon Steel, not stainless steel. Carbon steel needs to be wiped dry immediately after usage or it will rust. 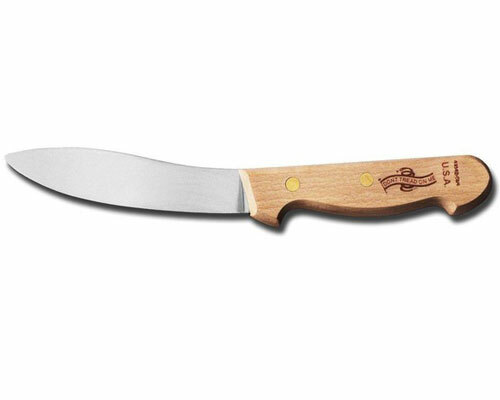 Great care has been taken by skilled craftsmen to produce an extremely sharp edge on this knife. 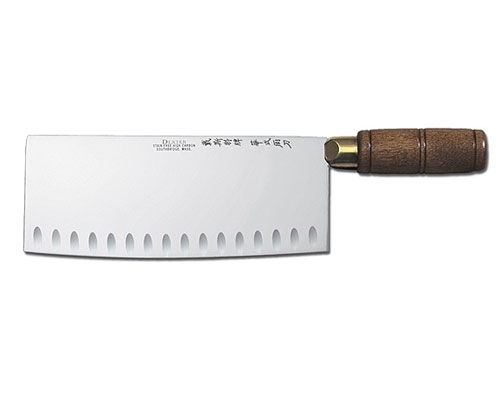 This Chinese chefs knife is for slicing, dicing and mincing. To prevent the edge from chip outs, break outs and nicks, avoid striking or twisting against hard or frozen materials. 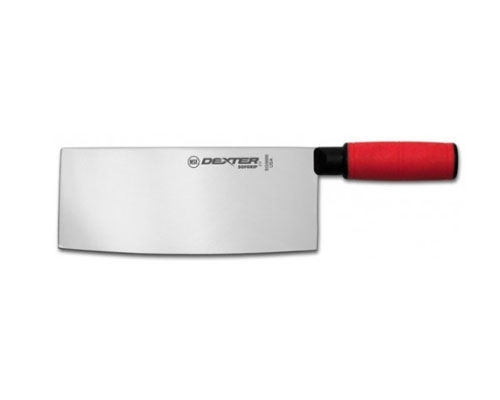 The Dexter 8 in.x 3-1/4 in.SofGrip Chinese Cleaver w/Red Handle features a handle that is non-slip, making it easy to use. A soft rubber grip reduces stresses that may cause fatigue and common wrist injuries like carpal tunnel syndrome. High quality stainless steel blade. NSF Certified. Made in USA. 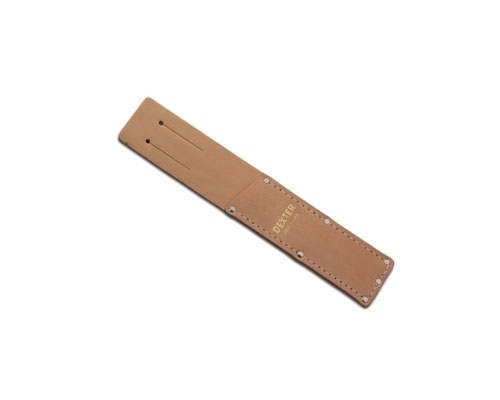 The Dexter Leather Sheath is perfect for keeping your knives protected while not being used. Fits any knife up to 6 inches long. The Dexter 3 in. 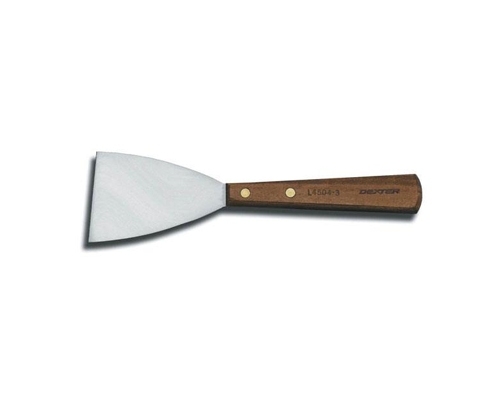 Grill Scraper is a handy tool to have on hand when the time comes to cleaning your griddle. The short blade is strong, and works well when scraping off burned-on pieces of food off of your grilling surface. The Dexter Russell 3 in. 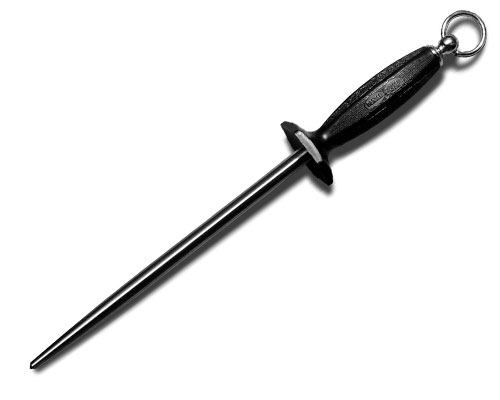 Forged Grill Scraper features a rosewood handle with brass rivets, that is comfortable to hold. The short blade is strong, and works well when scraping off burned-on pieces of food off of your grilling surface. The blade is made of tough carbon steel. The Dexter Cool Blue 3 in. Griddle Scraper will come in handy when the time comes to cleaning your griddle. The short blade is strong, and works well when scraping off burned-on pieces of food off of your grilling surface. 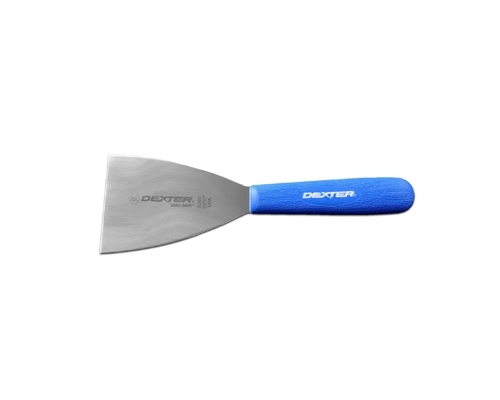 The Dexter bone scraper is used to brush down meat in the butchering process. Soft plastic works similarly to a dental tongue scraper. It removes bone fragments, dust and meat scraps from the surface of freshly cut meat. A Bone Duster may also used to remove film from aged beef. 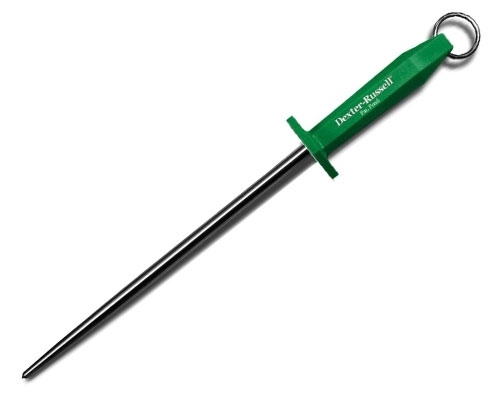 Dexter Russell Swiss Peeler is mainly used on hard fruits and vegetables.